Posted August 1, 2016 by Sami Kelsh & filed under Episodes. It’s the very last episode of The Musketeers, and I’m still a bit sad about that. Bad news: Treville is still dead. Worse news: Grimaud, who remains a very bad man, has wasted no time in blowing the heck out of the Musketeers’ garrison. Good news: the baddies think D’Artagnan is dead, which will no doubt make for a fun surprise later. Elodie (remember her? She was that awesome lady from the weird village who had a baby a few episodes ago) has come to Paris with her little munchkin, while the fellas prepare to face off against Grimaud, who somebody really just needs to shoot him, like, a lot of times. They’ve got Sylvie, who’s totally got a little Athos baby in the oven, though he doesn’t know it yet. Of course our heroes make a thrilling escape from the clutches of Grimaud and his people – and D’Artagnan takes particular delight in getting back at Marchaud at long last – but Grimaud himself manages to run off to safety, yet again. It’s like everybody’s aim just gets awful as soon as they try kill him. How many times has he made an improbable villainous escape now? Damn, dude. Meanwhile, Anne is settling into her regency, and seems like she’ll do a very good job at teaching the little king how to be a quality ruler. Also, her outfit is super cute. Grimaud, however, is blowing up the cathedral where little king was about to be blessed in front of lots and lots of people. Except he’s thwarted, soaking wet, in a really nicely lit basement. Pretty sure he’s dead this time. Well done, Athos. That feels good. Have I mentioned how much I love Anne? She gets stuff done. It’s nice to see her, at long last, getting to make decisions, both happy – offering the First Minister job to Aramis – and less fun – enlisting Milady’s skills in getting Gaston out of the way (which was fierce, and awesome). And the conclusions: they’re nice. 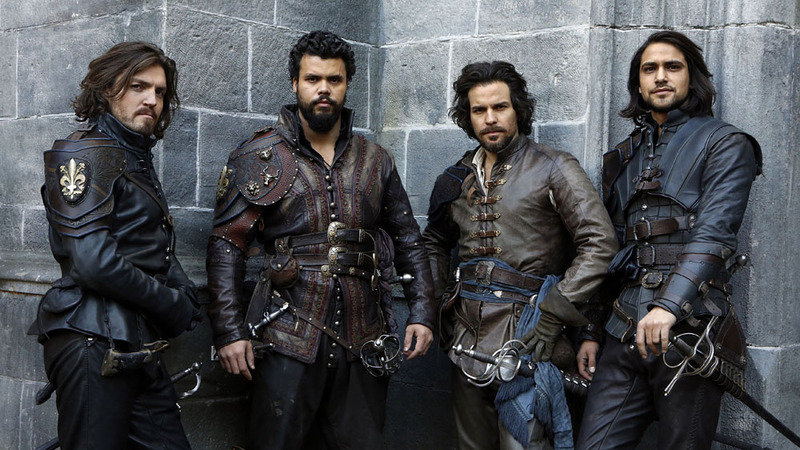 Porthos is a general with a nice lady friend, Aramis has a sweet new job and finally gets to spend quality time with Anne, and D’Artagnan takes over as captain while Athos is busy being a dad. It’s all magically wrapped up and very silly, but gosh, it’s been fun, and I’m going to miss this silly, wonderful show. Thanks, Musketeers. Aired at 9pm on Monday 1 August 2016 on BBC One. I’ll miss it too! Yes, it was daft a lot of the time, but it was great fun to see four nice looking lads doing their bit for the forces of good and for France. I also loved the cinematography and music, which were of the highest quality. It’s such a shame the BBC lost interest in it and shunted it endlessly around the schedules, even releasing it for broadcast abroad before they aired it in the UK, which I think was a terrific slap in the face for the show’s fans and for licence-payers in general. How can you say it was silly? It was the best show ever, and everyone finally got the happiness that they deserved…especially Aramis!